This program teaches couples to become more attuned, trusting, and open with each other and to more easily handle day-to-day stress and conflict. Based on the book Hold Me Tight, we will discuss key relationship concepts, watch demonstrative video clips, and do guided conversations designed to strengthen and deepen a couple’s emotional connection. All experiential exercises take place between partners in order to maintain personal privacy and provide safety. Since this is an educational program and is not therapy, a phone or email screening will be done prior to enrollment. In a weekend format, this couples workshop serves as a relationship retreat. It takes place at the Smith College Conference Center overlooking the pond. 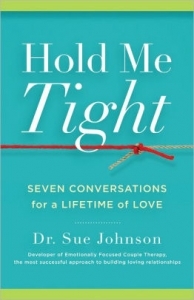 Hold Me Tight® is a registered trademark of Dr. Sue Johnson. Is this Hold Me Tight® program for you? Would you like a closer relationship to your partner? Do you sometimes get stuck in old repetitive patterns? Would you like to strengthen the bond between you? Deepen your sense of emotional safety and connection? This program guides partners to become more attuned, trusting, and open with each other and to more easily handle day-to-day stress and conflict. Based on the book Hold Me Tight by Dr. Susan Johnson, we will discuss key relationship concepts, watch demonstrative video clips, and do guided conversations designed to strengthen and deepen a couple’s emotional connection. All experiential exercises take place between partners in order to maintain personal privacy and provide safety. Nancy Knudsen, LMFT is a licensed marriage and family therapist with 30 years experience and is a certified therapist and supervisor in Sue Johnson’s Emotionally Focused Therapy (EFT) for couples. Nancy has led a number of Hold Me Tight® workshops and enjoys being able to help couples strengthen their relationships in this safe group setting. Check out The Couch, a podcast for couples, and hear the interview with Nancy Knudsen about the Hold Me Tight workshops! This workshop has helped us to create greater safety in our relationship. The exercises helped us learn how to recognize when we are in a downward spiral and to work together to quickly stop it and redirect to a more helpful and loving conversation. A Hold Me Tight weekend will provide you with the time, the structure and the tools to build a strong bond with your partner. I can’t think of any reason not to attend. Don’t wait until you need a Hold Me Tight workshop—go when the going is good and things will get even better.